From the author of the story collection The Rabbi in the Attic (1991), a finely crafted, if underpowered, first novel detailing the journey to wisdom of a young woman who grew up in a Borscht Belt hotel. 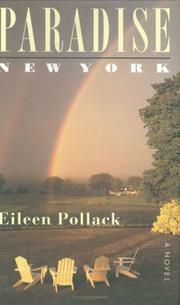 With messages not writ too large—though with enough signifiers hinting at their presence—Pollack’s tale focuses on narrator Lucy Appelbaum, who lives in a Catskills hotel called the Garden of Eden, near a town called Paradise. Her expulsion leads to wisdom. Growing up, Lucy enjoys a close-knit Jewish world; the friendship of Thomas Jefferson, a self-taught black handyman; and a sense of being ’special— lost only when she leaves for college. In reality, Eden isn—t entirely flawless: Lucy’s grandmother, disappointed by her life, refuses to improve the place; the food is stodgy, uninspired; the decor shabby; the entertainment increasingly third-rate. And, the guests (aging Communists, Yiddish-speaking families, and a couple who survived the Holocaust) aren—t getting any younger. Lucy’s parents want to sell the hotel, but her grandmother doesn’t, so Lucy decides to drop out of college to run it. In the year that follows, she restores the hotel; employs two gay kosher chefs; and dismisses Thomas, though realizing she loves him. When her unintended negligence causes the death of a popular guest, and when the hotel later burns down—in a fire that symbolizes what Lucy must lose before she really gains wisdom’she finally has to leave Paradise and head out into the world. There, though a reunion with Thomas fails, she begins to “understand that the only true refuge for a person in pain is in another’s heart.” An accomplished mix of profundity and wit that’s undercut by characters and a story more like talking points than fully-fledged aspects of a novel.